b. 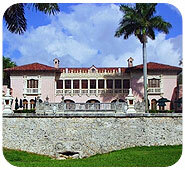 The Mediterranean Revival style defined Miami during the Boom of the 1920s. The style reflects the architectural influences of the Mediterranean coast: Italian, Byzantine, Moorish themes from southern Spain, and French. Applied Spanish baroque decoration is generously used around openings, balconies, and cornices. Parapets, twisted columns, pediments, and other classical details also are frequently used. Arches are often featured. The most common materials are stucco walls, red tile roofs, wrought iron grilles and railings, wood brackets and balconies, and oolitic limestone, ceramic tile and terra cotta for ornament. Patios, courtyards, balconies, and loggias replace the front porch. Fenestration is usually the casement type. With its elaborate detailing, Mediterranean Revival architecture works best in large buildings.